Exercise and proper diet are the best way to lose the excess fat, but unfortunately, some fat deposits cannot be worked off even with the most intense physical workout regimen. Fortunately, liposuction can be used to eliminate fat quickly and safely. Dr. Troell is a national instructor for the manufacturer of the VASER, Sound Surgical Technologies, teaching other plastic surgeons on the VASER Liposuction technique as well as face and body fat grafting. Dr Troell has performed over 700 face and body liposuction surgical procedures over the past three years. VASER is the best technique currently available for high-definition body sculpting. VASER provides 53% more skin retraction or tightening than suction-assisted (tumescent) liposuction, 26% less blood loss in low volume liposuction compared to suction-assisted (SAL) also known as tumescent liposuction with less bruising. 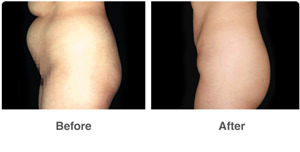 95% of VASER patients and physicians recommend this system of liposuction. Can be performed under local anesthesia only. Selectively target unwanted fat while preserving other important tissue. Used to remove unwanted fat and even provide high-definition body sculpting, such as tummy flab, bra bulges, love handles, saddle bags, double chins, as well as excess fat in the neck, arms, thighs, knees, male breasts and more. A more attractive physical appearance and a much higher level of self esteem. Less intra-operative blood loss and less postoperative bruising than SAL. A fast recovery time so you can quickly return to normal activity. Fat harvesting and fat grafting using the VASER method preserves fat cell viability and has revealed a 80% fat survival rate. There is a significant difference between the currently practiced liposuction techniques. The “traditional” suction-assisted or tumescent liposuction procedure uses a more “invasive” approach that includes general anesthesia, 10 to 15 mm length incisions, large bore cannulas, and a single arm to-and-fro movement for fat removal. “VASER Liposuction” that Dr. Troell provides is safe and a minimally invasive procedure with less bruising, fast recovery time and with the superior advantage of creating significant skin tightening and high-definition body sculpting Initially, anesthetic fluid is infiltrated using small16 gauge blunt tipped cannulas. This is followed by the innovative technique of delivering ultrasound energy of higher and lower pressure waves at 36,000 Hz from an innovative titanium probe. VASER or Ultrasound-Assisted Liposuction gets its name by using gentle ultrasonic energy to selectively target fat cells while preserving important tissue, such as nerves, blood vessels and muscle. Doctors have experienced great success in treating all of the following areas: abdomen, thighs, knees, buttocks, hips, back, arms, male and female breasts, love handles, chin, neck areas and just about any other body part you need treated.